For all of above there are easy techniques and tools to minimise or get rid of them for good. E-mail you can easily turn from your enemy to your good friend with couple simple steps. Read more here – how to get to zero inbox. For other areas there are countless books, blogs and guru’s to help you. For a start check this infographic on how to be productive or list of books and blogs at the end of this post. To realise those two you need to step back and look at a day in your life from bigger perspective. Day has 24 hours. 8 hours we spend sleeping so we have 16 hours left. This is divided approximately to 8 hours of work and 8 hours of “free” time. 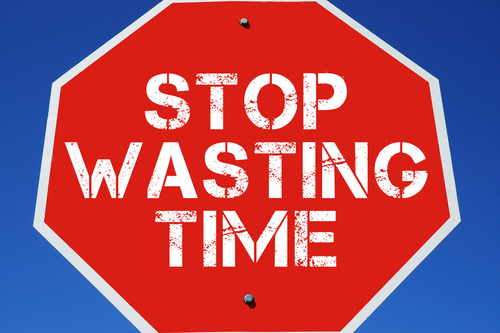 Thinking about those two 8 hour blocks of time will lead you to two biggest time wasters. If you are working in a job you don’t like you are wasting 8 hours every day. Many times even more than that. Obviously, in every job there are things you might not like. But overall, you should be happy with the job and enjoy it. Otherwise, it is only a waste of time. Simplest test is – would you do it for free? Would you continue working even if you didn’t have to? Should I quit? Read this post first. If you keep yourself stuck in relationship that is not working you are wasting another 8 hours (and more) in your day. I know it’s tough but in long perspective it is better to bear bit of pain now and have much better life later. Here I am not suggesting to break up relationship after one argument. This happens to everybody, but if long term it is not working, no need to keep it going. Those two are very connected because if you are not happy at work, it will show in your personal life and in relationship and vice versa. If you want to improve your productivity, you should start from bigger things. And only then start worrying about small things like email, meetings etc. Focus your efforts when there is biggest prize waiting for you – job you like and relationship that works.